THERE WAS A TIME when Louise Nevelson’s reputation far outshone that of the other Louise of postwar American sculpture: Louise Bourgeois. By the late 1960s Bourgeois still ranked as a minor scion of late Surrealism. 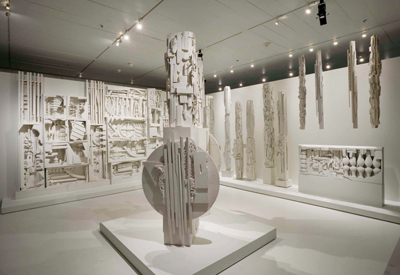 In contrast, Nevelson had featured with Johns, Rauschenberg, and Stella in the Museum of Modern Art’s “Sixteen Americans” (1959), attracted widespread acclaim, received numerous public commissions, and had a retrospective at the Whitney Museum of American Art in 1967. However, the two women’s subsequent historical fortunes are an object lesson in trading places. Bourgeois became a darling of avant-garde taste, whereas Nevelson went off the radar. The noble aim of the recent Jewish Museum retrospective was to rescue her from this limbo.